Ironically, in 2010 the founder of the league, “Spud” Mann lost. He now sports the loser’s tattoo on his upper thigh. It is a sparkly-horned, red-mane unicorn leaping to kick a football over a rainbow. A little red heart adorns the unicorn's haunch. Beneath the fanciful scene, Mann's thigh reads, “FANTASY LOSER”. This year's Tattoo League winner designed the perfect pop culture tattoo that would make any loser miserable. 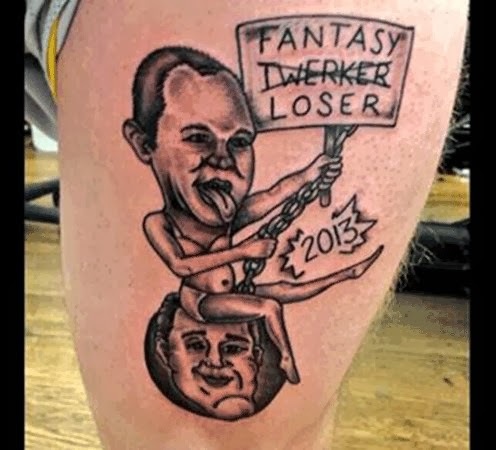 The losing tattoo is fantasy expert Matthew Berry's face on Miley Cyrus' body swinging on a wrecking ball made in the image of Jay Leno's face. Miley Cyrus is holding a sign that reads “Fantasy Twerker Loser”. Twerker is crossed out. Yes, it is as disturbing as it sounds! Grown men! Some with college degrees! Anyway, I tell you about the last place finisher in the tattoo league so I can tell you about this “last”. This is my last column in Pamlico News, at least for a while. I have enjoyed writing and greatly appreciate all the accolades. However, after three plus years of required weekly creativity, I’d like a respite. My thanks go out to editor, Maureen. She has been super-accommodating and simply wonderful. Thank you readers! And, as always, you can find me through my web site at http://www.Problems-Resolved.com and http://www.AmericasMindsetMechanic.com.